Up at four, my stomach is growling. It's hard to for me to believe that I feel hungry after the half of pizza I ate last night, but I am. I have a bowl of granola. Then I remember the ice cream I bought, can't take it with me and I don't want to leave it. I eat two bowls of it and finish off the carton. Steve and Shelly pick me pick early to drive me back to the trail. Shelly is such a fun and joyful person. I am honored that we get to work together to raise money for ALS research. We stop by my daughter, Kristin’s place and I pick up some pre-trail trail magic chocolate chip cookies. We stop at Starbucks and I get Venti mocha, my favorite. It's so much better than the ones I try to make for myself in my tent. Then we stop for breakfast and I get the breakfast with two eggs, two sausages, and two pancakes. I eat it all, feeling pretty full. Shelly can't finish her sandwich, I agree to take the other half, remembering my rule from Mojave about never leaving food behind. We get to the trailhead and I finish Shellys sandwich. Unbelievable! How is it possible that I could eat so much? There's a Thru-hiker there trying to get to Truckee and Steve and Shelly decide they want to take him. That's the kind of people they are, generous and giving. 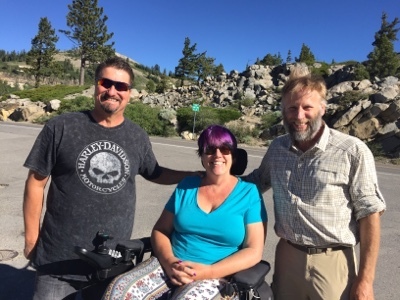 So Deluxe gets his ride, Steve and Shelly make a new friend, and I begin hiking again. I hike from old highway forty to the I-80 interstate. The in between land. I've never hiked this before. I sort of feel it's just a connector between the trail south and the trail north. I travel through the tunnels under the interstate and head north towards Castle Pass. My sister, Carol and my friend Adrianne are meeting me at the pass. First I have to get there. I've snowshoed there many times in the winter. Never have I been on the PCT. The trail through the valley up there's beautiful in the summer. The trail is changing from that cobbly rock strewn trail of the Donner area into something close to the ideal trail. Smooth, clean, and dry. They are there at the pass waiting for me. It's so fun to meet people I know along the trail. We eat cookies and other stuff. Carol gives me Butterfinger candy bars and a small plastic bottle of Cabernet. Wow, I have so much good stuff. Carol and Adrianne continue their climb of Castle Peak, I head off toward Peter Grubb hut. The furthest north I've ever been from Donner summit. It does take long to reach. It's so much faster to hike than to snowshoe. I pass it without stopping and head out into the unknown. The next familiar place being Crater Lake in Oregon. From here to there is all new PCT trail to me. The trail has completed its transition into ideal trail. It is smooth, rock and root free, and very moderate grade. I feel like I am cruising along. The forest is green and friendly, welcoming. Unlike the desolation fairy forest. This forest is welcoming and wants me to be there. No mosquitoes swarm when I stop. There are inviting places to sit , whether shade or sun, both options are available. The meadows are green but not soggy. The streams clear and within their beds they bubble and gurgle in a way that makes my heart feel light and glad to be alive. The forest is managed. There are places where it has been logged. Some recently, some less so. The recent places look scarred and rough. Dead branches and logs litter the floor. Older places have had the time to digest and decompose that litter into top soil. The forest is open and there is room between the trees for the sunlight to reach the ground. Plants and flowers live in these open and sunny glades. I climb through this friendly forest to the ridges where I have views to the rounded rolling hills to the north. There are a few place where volcanic rocks and boulders provide dramatic effect but on the whole my hike forward appears to be headed to a benign and forgiving place. I stop at a small stream for the evening in plenty of time to setup, cook, and finish my chores before dark. The darkness comes, and with it cool air. Perfect for sleeping. I settle into my downy nest fold for the opportunity to be here. Coming up for you is the section I did last year from 49 to 70. I lived in Quincy for many years and that section is 'home' to me. Lovely views and the flowers should still be cheerful and welcoming for you. Enjoy and say 'hey' to Sierra and Plumas Counties for me. Go up to the Buttes fire lookout if you can take the time!